This came to me on Friday, and I haven’t been able to get it out of my head. Please don’t take this to mean more than it does. I’m not manipulating any numbers. I just want to show you where the numbers lead. I’m going to focus on LeMahieu’s performance between 2016 – 2018, because it was in 2016 that LeMahieu changed his baseline strikeout rate. He’s been that kind of hitter for about three seasons. Okay, on we go. At FanGraphs, we have batted-ball data stretching back to 2002. So now I’m going to compare recent LeMahieu to hitters from the past 17 years. You ready? Since 2002, there have been 854 batters who’ve come to the plate at least 1,000 times. LeMahieu is a right-handed hitter. Narrowing to right-handed hitters drops that pool from 854 batters to 488. LeMahieu has walked in 8.5% of his plate appearances. It wouldn’t be fair to just set a cutoff at 8.5%. Let’s use 7.5%. Roughly league average. Narrowing to walk rates of at least 7.5% drops that pool from 488 batters to 245. LeMahieu is a contact hitter, striking out in 13.3% of his plate appearances. This time, let’s draw the line at 15%. I know that strikeout rates have been on the rise, but I don’t want to overcomplicate things. Narrowing to strikeout rates of at most 15% drops that pool from 245 batters to 62. LeMahieu also happens to be a ground-ball hitter, putting the ball on the ground 52.1% of the time. Some see a ground-ball profile; others see a line-drive profile. This cutoff is going to be 50%. Narrowing to ground-ball rates of at least 50% drops that pool from 62 batters to ten. What’s one of the other most distinctive things about LeMahieu at the plate? He likes to go the other way. LeMahieu has hit 35.4% of his batted balls to the opposite field. Let’s just use a nice, round cutoff of 30%. Narrowing to opposite-field rates of at least 30% drops that pool from ten batters to four. And, finally, LeMahieu does have a little bit of pop. When he’s hit a fly ball, it’s gone for a homer 9.8% of the time. You know that number as HR/FB%. This time, it doesn’t matter if we draw the line at 9%, or 8%, or 7%, or 6%, or 5%. Narrowing to HR/FB rates of at least any of those numbers drops that pool from four batters to one. That one batter is Derek Jeter. This is Jeter from 2002 – 2014, over more than 8,000 trips to the plate. This is Jeter from between the ages of 28 and 40. Jeter was a very good player, also, between the ages of 22 and 27. But the profile was always a similar one. Jeter was a contact hitter who drew his share of walks. He hit from the right side and put a hell of a lot of balls on the ground, but he’d also pepper right and right-center with sharp grounders and line drives. From time to time, a ball would clear the right-field porch. From time to time, Jeter would turn on a pitch inside. It was a slightly different era back then, and Jeter didn’t face as many hard-throwers as LeMahieu does, but that’s the style. As a Yankee, LeMahieu is likely to look like Jeter did. Here are their spray charts, courtesy of Baseball Savant. Jeter’s includes a lot more data, but it also includes zero Statcast data, for whatever that’s worth, so all the locations are more approximate. It’s easy enough to see they hit the ball to similar areas. Jeter would assume more of a closed stance, suggesting more *intent* to go the other way. But LeMahieu isn’t the kind of hitter he is by accident. He isn’t one of the most extreme opposite-field hitters of his era by accident. LeMahieu often has that intent, as well. It just isn’t so evident in his feet. Whether you’re talking about DJ LeMahieu or Derek Jeter, these hitters are almost unshiftable, at least by traditional standards. LeMahieu has been confronted by a very different kind of alignment. To be absolutely clear about this: Derek Jeter will be inducted into the Hall of Fame. DJ LeMahieu will probably not be. Jeter was better than LeMahieu, in part because Jeter was faster than LeMahieu, and Jeter was also a recurring playoff hero for New York. He dated well-known women, being a celebrity as much as he was an athlete. He earned hundreds of millions of dollars. Derek Jeter built a brand and an empire. Some number of years down the line, many people might’ve forgotten that LeMahieu ever wore the same uniform. Again, don’t read too much into this. This is basically just an eleven-hundred-word fun fact. But I, at least, find the fact pretty fun. 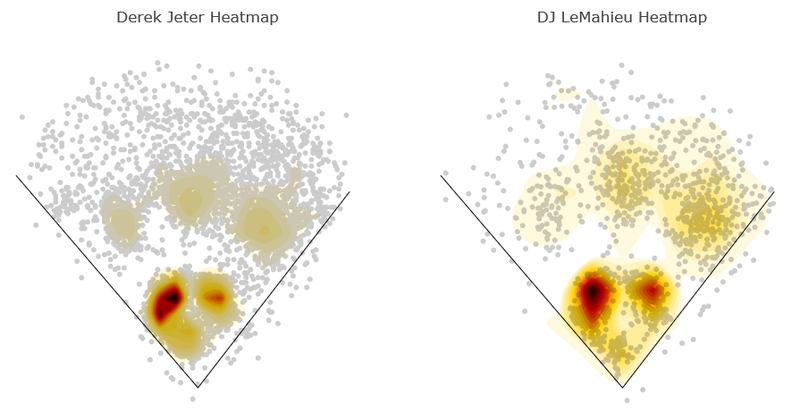 It’s some kind of wacky coincidence, as well, that LeMahieu goes by DJ. Between LeMahieu and Jeter, the offensive profiles are shockingly alike. Yeah, LeMahieu is far and away the better defender, but there’s a reason I didn’t bring that up. This is a post about what they have in common. We hoped you liked reading DJ LeMahieu Is Going to Look Familiar by Jeff Sullivan! Nice comparison. It goes to show you that hitting the ball the other way has a huge impact on batted ball success. To my knowledge, batted ball projection models don’t put much thought into H-angle, but it matters a lot. All we ever hear about it LA and EV, but there is a lot more to success than that. There are a bunch of realities that come with a non-dead pull approach that help a hitter be successful as well – like waiting back on the ball. H-angle matters when it’s a consistent skill of driving the ball to the corners. few players can do that but when it happens it can lead to very hot stretches. For example, Didi gregorius’s april of last year was almost entirely the result of many flyballs into the right field corner. but generally pulled flyballs are more productive than oppo flyballs or center flyballs. hitting oppo isn’t in itself a universal virtue. if you have extreme bat control, the way to maximize your natural power into production is simply to pull the ball into the corner ala mookie betts. Yes. It has to be noted though that it is harder to hit pulled balls into the air especially if you have some mechanical deficiencies in the swing that prevent that. Le mahieu like Mauer and Hosmer (and yandy for that matter) is absolutely unable to hit any pulled fly balls. If he tries to pull the ball it is always a grounder. Because of this this type of hitter actually needs to hit everything center away or they just roll over it. His approach is smart and maximizing his potential but it is a fix for a technical weakness, ideally he would have a swing that allows him to hit air balls to all fields like Martinez or trout but he can’t do that. Telling him to pull the ball more would hurt him unless you make dramatic mechanical changes to his swing which probably won’t happen at his age because he is still too good and well paid to risk that change (guys like heyward show that swing changes are risky and can go the other way too which is why mostly end of the road fringe players like JDM make those changes). I’d love to see a version of xWOBA that incorporates H-angle. Sadly, I can’t find raw H-angle data anywhere. I’m pretty sure xStats takes horizontal angle into account, this being the biggest differentiator from Savant’s xwOBA. Someone correct me if this has changed.